It’s great to be back after a short hiatus. I welcome you to yet another edition of SteemMag, (the nineteenth edition), a weekend digest for Steemians. This week was a historic one on Steemit. After so much waiting, the Blockchain Hardfork 16 happened on Tuesday bringing in a number of critical changes to the economic and user adoption state of Steemit. The changes were expected to bring much needed increase in investment rates and user adoption. In true SteemMag fashion,I reached out to a number of key Steemians asking their opinions about the state of Steemit after HF 16. In a bid to bring even more awesomeness, the @steemmag dedicated account has been created. Pls do follow subsequent issues will soon be published using the @steemmag account. SteemMag reached out to @clayop – a whale and avid commenter on the affairs of Steemit especially as relating to Price of Steem and SBD. I also reached out to @liberosist – the popular Steemian who doubles as a top curator of Curie – the curation project aimed at an equitable distribution of the rewards pool. 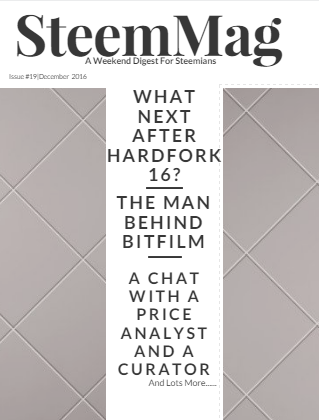 SteemMag had a chat with @aaronkoenig- The Steemian behind the widely known Bitfilm and also the producer of the Steemit Film. There has been so much expectation of an influx of new users after HF 16. As this occurred? Yes, there's been a mild influx of new users in the last couple of weeks. However, a more significant change is greater activity from returning users. A lot of people who were ignored and gave up on Steemit 3-4 months back are giving it another shot. It's exciting to see returning authors rewarded by Curie - we hope they stick around this time! Currently, engagement stats are up 20%-30% over November. SM: What are those things you think need to put in place to attract new users?? To put it simply - the platform needs to be much more elegant. Right now it's an engineer's platform rather than a designer's one. Throughout history, there have been many competitive battles between convenient solutions versus powerful ones. Convenience has triumphed always, time and time again, particularly in the tech industry. Geeks would moan about that fact, but the world at large has spoken. There should be not more than one visible currency, users should be able to buy Steem/SBD with their credit cards, and withdraw to their bank accounts/PayPal etc. The registration process can be much more delightful, and simple features like password recovery should be readily accessible. The users should just register, post, vote and earn. Creators and readers should not and will not care about the underlying economics, that it runs on a blockchain etc. Other simple fixes would be getting rid of some of the over-regulation, i.e. 4/day limit, comment tree limits etc. Of course, I'm also anticipating many social features and a more elegant UI. But most importantly of all, concerted outreach programs to recruit creators. There are thousands of bloggers out there who have decent following but haven't been able to monetize the attention they generate. They should be pretty easy targets. Get a few hundred of them on board, and you also get a few million new readers who follow them; many of whom would also be creators. One of the main complaints has been the unfair distribution of rewards among users. How has this changed over the months? Most certainly. With curation guilds now a large part of Steemit, the distribution of rewards has become a very, very long tail. Previously, it was only a couple of dozen authors who received a vast majority of rewards. A couple dozen authors benefited greatly. Today, every single day over 300 authors are rewarded. Of course, now the complaint would be too many are being rewarded, but that's a debate for another day. As for the underlying distribution of Steem Power - no, that has not changed. What potential effects do you see the new Hardfork having on content creation and curation? Not much really. If the hardfork were to lead to higher Steem price, that'd encourage more creation and curation. (Which is what has happened currently - Steem is trading at 2x the price pre-Hardfork announcement and declining) The faster power downs are also an incentive for creation and especially curation. Thanks @liberosist for taking the time to have a chat with SteemMag. And the enormous amount of time and energy spent making Steemit a better place. The price of steem has risen recently, is this a direct effect of the HF 16 news? One of the main features of HF 16 is to make the powerdown rate faster and shorter... Has there been a notable difference between pre and post powerdown rates? Yes. I already posted a comparison and @jesta is providing a real-time data here. Before hardfork, weekly powerdown rate was 3317 MVESTS. Now it is 5842. But the large part of increases caused by few whales. The price of SBD has been stable for a number of weeks. Why? And do you forecast this lasting even after HF 16? I cannot tell since there will be great amount of powerdown at the same time potential buy demands too. Do you think HF 16 is guaranteed to bring in new investors as guaranteed? I think that's a natural outcome. But HF16 just opened a door to new groups of investors (as well as who does not believe in Steem any more). Getting in or out is up to fundemantal value of Steem and perfomances of our devs and community. Thanks @clayop for participating in this weekend’s feature. It’s inspiring to see you dedicate so many resources in ensuring stable Steem tokens. Another great edition:) Will follow the new account too of course! This post has been ranked within the top 10 most undervalued posts in the second half of Dec 10. We estimate that this post is undervalued by $37.46 as compared to a scenario in which every voter had an equal say. See the full rankings and details in The Daily Tribune: Dec 10 - Part II. You can also read about some of our methodology, data analysis and technical details in our initial post. These interviews are extremely interesting to read. Great insight into steemit and especially in light of recent events. Thank you for sharing these!